With Millennials gradually replacing their parents (baby boomers) strength in purchasing power, many brands are trying to connect with this lucrative group of consumers better. One of those brands happens to be fast-food giant, McDonald’s, which over the past years has lost touch with this particular segment. 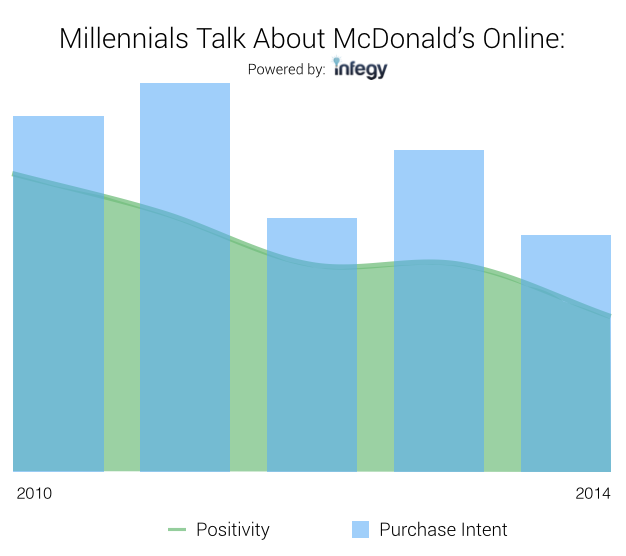 Over a span of five years on social media, not only have Millennials’ positive sentiment towards McDonalds dropped, but conversations about purchase intent have dropped as well (lowest in the last five years). 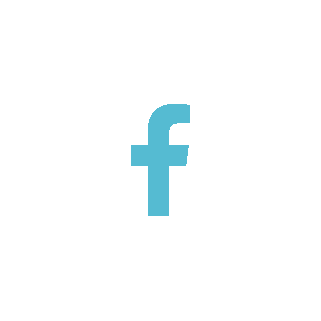 To determine where McDonald’s went astray, and what the brand can do to re-engage Millennials, I looked to the world’s largest focus group (social media) for answers. Here are five recommendations for McDonald’s driven by Millennials on social media. * Data was collected from 47,393 sources (identified Millennials talking about McDonald’s) specifically within microblogs (predominately Facebook and Twitter). Who on earth stops serving breakfast at 10:30am? Oh right, McDonald’s does. While it may be more efficient for McDonald’s to stop serving breakfast by 10:30am, some Millennials demand to have their breakfast needs met a little later than that. 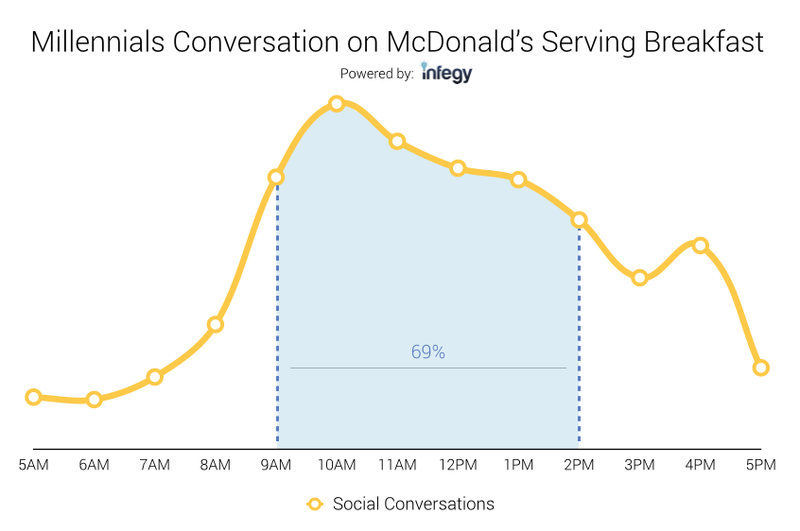 Over a span of two years and in a 12 hour window, 69% of posts from Millennials online talking about McDonalds serving breakfast are between 9am and 2pm. With McDonalds halting breakfast at 10:30am, approximately 50% of those Millennials (9am to 2pm) are still talking about breakfast. We understand that logistically it’s impossible for a regular McDonald’s establishment to hold both breakfast and dinner menus on-hand, but even having the top 5 breakfast menu items extended ‘til at least 12pm would be much better than cutting breakfast off completely at 10:30am. Come on, McDonald’s! Brunch time is where it’s at. For the late-night prowlers, McDonald’s needs to give Millennials an extra reason to choose them over other late-night rivals. Sure, being open 24 hours has its perks, but there’s a lack of excitement and incentive in choosing such a monotonous fast-food restaurant. Chipotle, a fast-food restaurant that isn’t typically known for being open late, is now being talked about more often than Taco Bell. Perhaps Chipotle will look to stay open later in the future for their burrito craving Millennials? 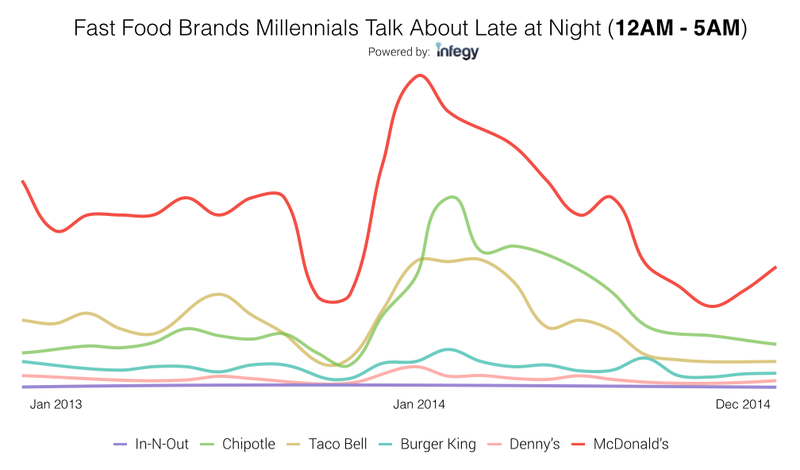 Whether or not Chipotle chooses to do so, McDonald’s still needs to take note of these Millennials and make some changes themselves to stay as the superior late-night choice. Late night McDonalds.....is there a better thing? For now, McDonald’s remains as one of the convenient hot spots to go to after a late-night out but with fast food chains like Chipotle gaining more traction, McDonald’s needs to lookout for the future. Why not narrow down the late-night options even more by giving consumers something “exclusive” to look forward to? One of the most highlighted conversations on social was picked up by Millennials expressing negativity with their encounter for extra sauce. While many other fast-food chains hand out extra sauce without hesitation, Millennials have taken notice of this difference with McDonald’s (especially with sauces for their nuggets). Mcdonalds Will Give You Bout 20 Nuggets With 1 Sauce . . Then Have A Attitude When You Ask For More . . Giving attitude or nickel and diming for extra sauce will not only annoy these consumers, but it will also give them an additional reason to go elsewhere for their nugget needs. 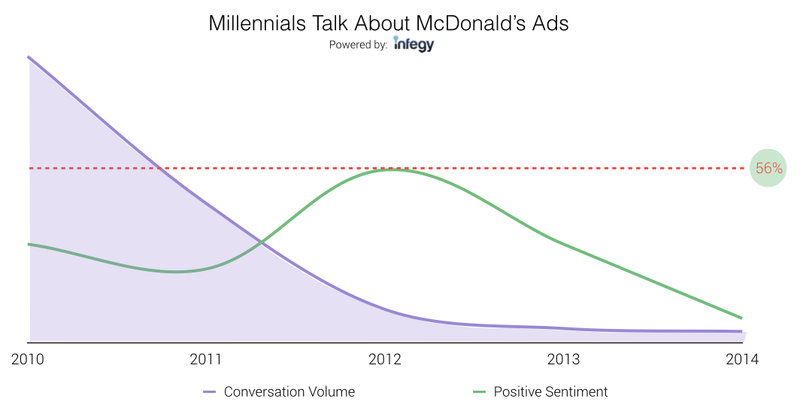 While Millennials’ conversation about McDonald’s ads have decreased over the years, the positive sentiment about the ads has fluctuated. 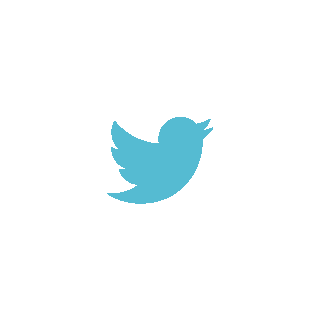 Out of the last 5 years, 2012 had the highest positive sentiment towards ads (56%). In 2012, positive sentiment was driven by McDonald’s usage of elderly people with a comedic twist in their ads. However, the negative sentiment can be attributed to McDonald’s trying too hard to target black demographics. Similar to Millennial’s encounters with extra sauce, their encounters with McDonald’s recent Superbowl XILX ads are no different. While the overall reactions were more positive than usual, the sweet and chipper employee used in the commercials drove negative sentiment amongst Millennials expressing a different kind of encounter with McDonald’s employees. The topic of increasing wage for McDonald’s workers has become a sensitive issue nationwide and while the easiest suggestion may be to simply increase the pay, McDonald’s needs to take a step towards giving consumers an explanation as to why the pay is the way it is. Millennials perceive McDonald’s as a company that doesn’t care for their employees and if this is truly not the case, McDonald’s message to the public needs to change. 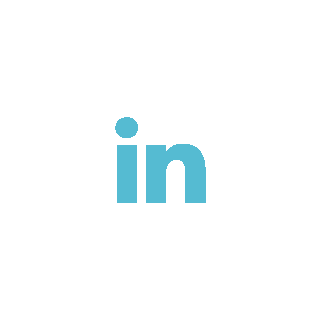 To get additional insight on what McDonald’s can do to better connect with Millennials, check out, How McDonald’s Can Turn Millennials into McMillennials, by Marissa Vidler, co-author of Millennials with Kids (August 2015).